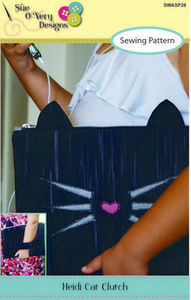 This adorable Cat Clutch named after my daughter is just like her, sweet and sassy at the same time. Constructed using a sewing machine and super simple stitching techniques. The zipper is inserted so easy and clever and the inside is fully lined. There are two versions for applique, of the Cat nose and whiskers, Raw or Satin Stitched, and there are even cat ears that pop out of the top of the zipper. On the back of the clutch is a strap for easy carrying option that is unique and simple to assemble. Finished size is 9in tallx12in.